In college I drove 279 miles from Spokane, WA to Seattle, WA alone. I remember turning up the music full blast, rolling down my window and eventually pulling over numerous times to jump around on the side of the road in an attempt to wake myself up. In our early years of marriage, there were a few times that I offered to drive on a long trip to relieve Trent when he was getting sleepy. I never lasted more than 30 minutes before he needed to take over again for fear that I would be the one to fall asleep. Therefore, you may understand when I say I had a legitimate concern about driving the van on this trip. “We may die or at the very least, we may arrive a week later than expected due to frequent stops to wake myself up,” I reasoned. At the beginning of the trip, I did struggle. Montana worked out okay, partially because I was on an adrenaline high from beginning our adventure. However, South Dakota was harsh. My mind was turning to mush out there on the prairie and was threatening to blow away my focus like the tumbleweeds. By the time we arrived in Minnesota, Trent and I were having serious discussions about leaving the van at his parent’s house and simply continuing together as a family in the truck. This option would be doable, but not ideal. Having a second vehicle gives us freedom and flexibility. 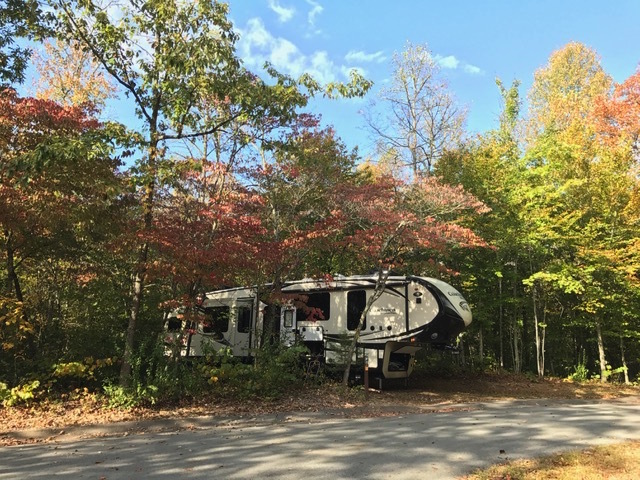 We can easily leave the truck and RV at the registration desk at a campground, jump in the van together and scout out the best RV site without having to navigate the truck and RV around the countless loops. Once we are parked at a campground, we can use the van for day-trips. Should the truck (or van) have issues, we are not without a second back-up vehicle . . . However, none of these options matter if I can’t stay awake. Somehow a little miracle happened. This last Thursday I drove 256 miles, stopping just one time so Trent could gas up. I could have kept going! My driving muscles seem to have slowly strengthened with each passing mile. Is that possible? Perhaps more probable is that the landscape has grown increasingly more interesting as we’ve traveled. Thursday was no exception. We left Indiana in the morning and arrived in Virginia by mid-afternoon. It was slightly mind blowing to leave the mid-west and arrive in the east-coast in a matter of hours. Driving through the state of Kentucky was a treat. The distant hillsides were filled with tremendous texture as the hardwoods heralded their splendor, intermingling color and shape and size. Closer to the road we were treated to picturesque views of fenced green meadows with grazing horses. Who could possibly fall asleep while seeing this for the first time? 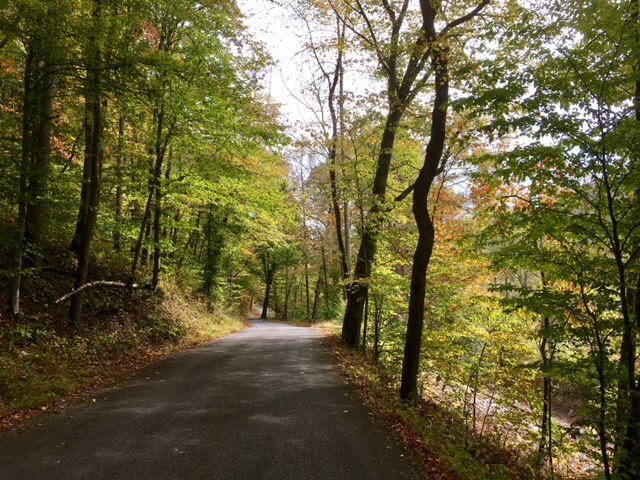 As we arrived at our campground location in the Cumberland Gap National Historic Park, we felt doubly blessed to be situated in such a lovely location for a portion of our trip designed for downtime. After enjoying a slow start to our morning and completing our school goals, we ventured out to the ranger station for the Cumberland Gap National Historic Park. After our three youngest finished their Junior Ranger booklets and received their new badges, we ventured up to the pinnacle overlook. 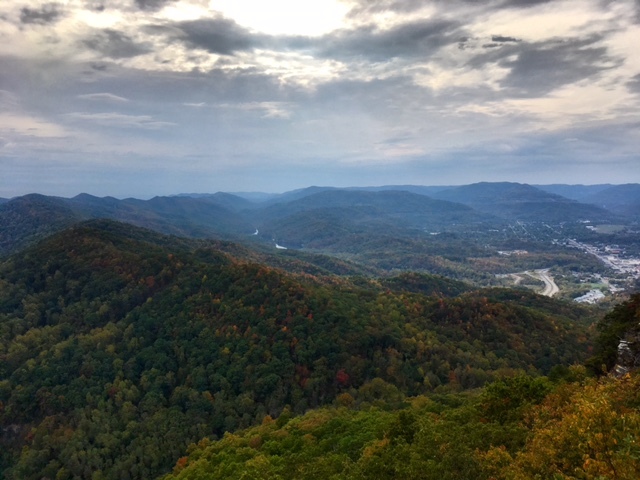 From this location we were able to take in a breathtaking view of the Appalachian Mountains and see where the three states of Kentucky, Tennessee and Virginia come together at the top of a nearby ridge. We could also locate the Cumberland Gap where between 1175-1810, 300,000 settlers traveled after Daniel Boone helped clear a trail for their travels. The kids hurled countless acorns over the side of the viewing platform, but no matter how hard they tried, the acorns kept landing in Virginia. Fact: I’ve now driven over 2,200 miles. Fact: I’ve been the only adult in the vehicle. Fact: I have had at least 3 of the 4 kids with me at all times. Fact: We are all still alive. Cumberland Gap National Historic Park has no admissions fee. Camping is $20 for a site with electricity and $10 without. There is no water or sewer. Camping is first come, first serve with no reservations. They have a lot of sites but many of them are too uneven or too short to work for our 40-foot RV so this was a time in which we appreciated having our van along to help us scout out where we wanted to go. Despite the fact that we arrived mid-week, nearly all the sites with electricity were full. We ended up staying at a non-electric site. The public bathroom and showers are very clean. The camp hosts were friendly, quick to welcome us and fill us in on the details of the park. We spent about 1 ½ hours at the ranger station. If we were not helping kids with their Jr. Ranger booklets we would likely have been there 45-60 minutes. There are Gap cave tours available for $8/adult, $4/child (ages 4-12). These book up early so plan at least a day in advance. We opted not to do a tour here as we recently did a cave tour in South Dakota (Jewel Cave) and plan to visit one again in a few weeks (in the Mammoth Cave area). There are many hiking trails in the area as well. So proud of you that you’re doing so well driving such long distances. Good job! I love reading the updates and seeing the pictures. What a beautiful world our Lord created! Hellos and hugs to all. It is a beautiful world, God is so creative! Thanks for checking in, I love having you along for the ride :). Hooray, you made it! I am the same way, I quickly get sleepy when driving or riding, especially if the terrain is less diverse. I have Hot Tomales or Cinnamon Bears and sometimes chocolate covered coffee beans in my arsenal when I know I will be the only driver for a long while. New-to-me scenery would help too! 😉 When you say “no water or sewer”, does that apply to the RV sites or the whole campground, since they did have public showers and restrooms? I really like the details you include in the “travel details” sections; so helpful. Hmmmm chocolate covered coffee beans, that might be worth a try! As for the water and sewer, some of the sites had electricity but none of them had sewer at the RV site (although they do have a dump station as you leave). I don’t believe that any of them had water hookups but maybe I’m remembering wrong, the sites that had electricity may have also had water. . .